Here’s my favorite photo – it’s Bunny with her kids. I swear, they’re all almost as large as she is. 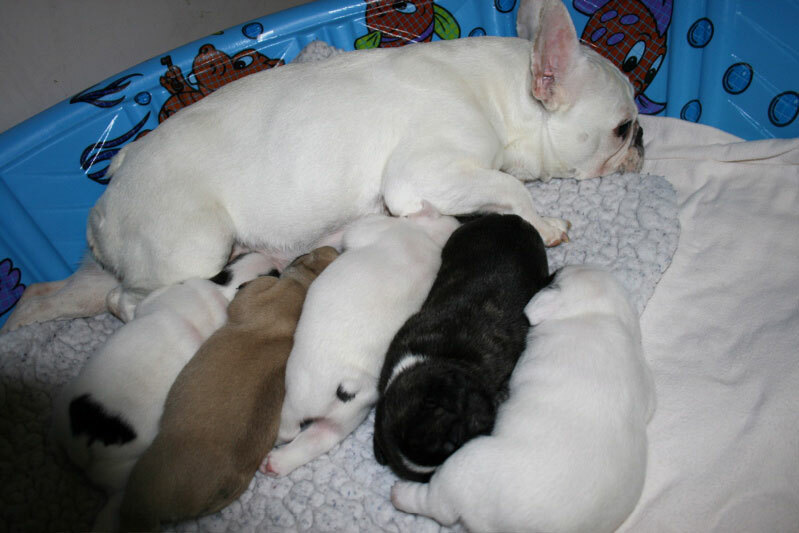 Mind you, Bunny is on the small size – and those are some mighty chunky puppies! You can check out the slide shows below, or see the images full sized over on Flickr. My Mama says I am cute too, so we have something in common! My Mama helps me write my own blog about my life, my girlfriend Dogette, my training, my walks in the park… it’s a dog’s life! Maybe you’d like to read it. What pretty pretty babies. I bow to your ability to raise hem and keep the site updated! My lower back keeps hinting that frenchies are so much more portable…. Years ago, I was on a Bull breed mailing list, and there was someone on there who specialized in breeding ‘black’ Bulldogs. Apparently, it was quite the controversy, but I thought they were just STUNNING. Plus, I recall she was doing hips and hearts, and her dogs seemed a sea of sanity in the midst of dogs that were just mysteriously dropping dead at three or four years old. I can’t remember her name, but I know she was on the west coast. I’d still take a black/very dark brindle Bully in a heartbeat! .-= Cait´s last blog ..Congratultions =-. everytime she needed to take a leak. I could not do it because of my knee, so Ken was anointed. She wasn’t even fat — just 40 lbs or so. But dead weight. A portable dog seemed like such a nice idea. And if you use the outward hound life jackets, there’s a handy dandy carry handle. My bully (RIP) had many ortho problems which required being carried up and down steps for weeks at a time, including the 13 steps from the street to the front door. I could not carry her, so my husband was stuck. After her passing, we resolved on a more portable dog. I still adore bullies, but until I live in a Ranch, no. Black is considered “highly undesirable” It’s not a disqualification. Most black bulldogs are black/tan or black/tan brindle. All dates back to a big bruhaha in the late 1880s over the colors for the standard. Not probably worth the fight to change it. If I could rewrite our standard tomorrow, my priority changes would be to eliminate the “as short as possible phrase” relating to nose length (most serious breeders don’t believe it it anyway, another hang over from the late 1880s when noses were generally longer) and change “highly undesirable” for black to “least desirable of accepted colors” which ought to piss everyone off but not change things all that radically. In my dream, eye and breathing difficulties would disqualify. As for brindle, like frenchies, it does not/should not matter if the dog has only one stripe it’s genetically brindle and that is mine and most breeders take on how much black is too much. In EBs if you want deep reds, a dark brindle whose black is truly black will produce them when bred to other reds or some fawns. If you want great pigment, a black skinned, heavily ticked white is your go to. Large kennels used to keep black and also dirty/smutty whites to breed to even if they did not show them. I have finished two black masked “dirty” whites. The american all-rounders could not figure them out. The british judges freaked out over them as the color has been by and large lost in the quest for flash. I have frozen on a deceased dog who was dirty and dominant for the masking and heavy ticking, thankfully! But there are always sticks in the mud! And this little girl, provided she vets tomorrow, is really minimally brindle. And her black is BLACK Great jet black eyes, nails, nose and pads. Show name will be Adamant Black Cherry Spin, because of course black cherries aren’t really black either. I don’t mind showing a dog who is correct but raises questions. I have skin like a rhino and generally relish the opportunity to educate. Last time I was showing a dark brindle, who had less black than this girl but whose base color was dark mahogany red (indoors she looked black outdoors she GLOWED in the sunlight, really a cool color) an “instant expert” came up to tell me she was black. No. Well mostly black. Sorry close only counts in horseshoes and hand grenades, try again. Well she “looks” black. Well you look like a thoughtful, intelligent person who can learn something but are currently proving that wrong. Sputtering, red faced end of conversation. 6 months later he actually told me I was right! I’m loquacious today, trying to stay still in this heat!